Philadelphia's luring alleyways and narrow streets are further characterized by doors of all colors. 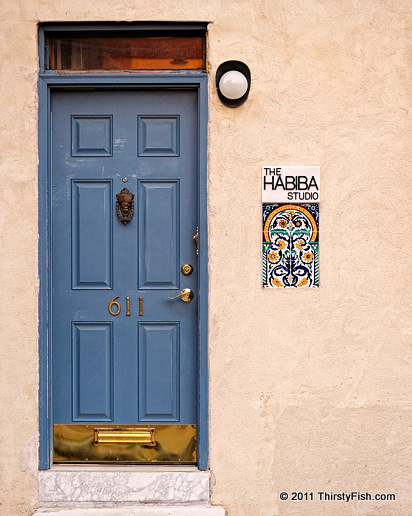 The Habiba Studio is a Middle Eastern dance studio located in an alley just off South Street. Multiculturalism is the preservation of different cultures and cultural identities within a unified society. Since the colonial times, Philadelphia has been as one of the most multicultural cities in the world. Although many of us associate The Middle East and the Islamic World with camels, belly dancers, oil and instability, especially between the 8th and 16th centuries, Islamic culture has made many contributions to Mathematics, Astronomy, Medicine, and Philosophy. Science, Philosophy and Wisdom do not belong to any one people, culture or religion; nor do Ignorance, Falsehood or Folly. Anyone who claims otherwise is either delusional or psychotic.